This rugged 5+1DOF robotic arm (Jaguar Arm Plus) is specially designed for compact and medium mobile robots that demand higher DOF, longer reach and larger payload capacity. It is light on weight, low on power consumption and compact on size. It has 5 DOF + 1 DOF gripper, with maximum reach of over 1070 mm (42 in), max payload capacity of 10Kg at max reach, while weights under 15Kg. Wrist mounted color video camera (Option) provides high resolution (640x480) close-up view. 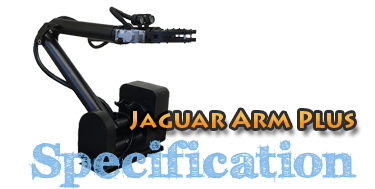 Jaguar Arm is ideal for object inspection and handling. It could also work as an articulated sensor platform. Integrated software features independent joint space control as well as gripper Cartesian space control. It feature 5 rotation joints (excluding gripper), including Base Pan, Base Tilt, Elbow Joint, Wrist Tilt, Wrist roll. When working together with the Jaguar mobile robot, Jaguar Arm could achieve full 6DOF, and reach virtually any position and at any orientation within its allowed working space.